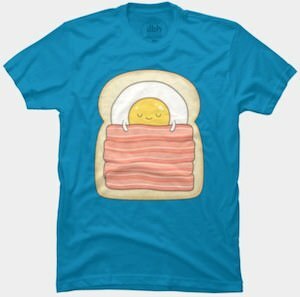 Show people that you missed breakfast by wearing this Burning Toast T-Shirt. 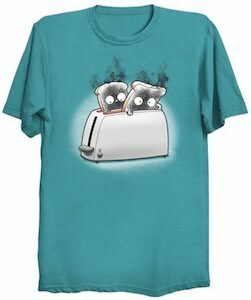 On this t-shirt you can see a toaster and two slices of bread trying to crawl out of it and they are already burned black and even smoking. So when you wear this t-shirt people may offer you a sandwich as it is clear that you are running out of bread after burning it. You can get this funny t-shirt in styles for men and women and it comes in sizes Small – 6XL. So be prepared for your next breakfast by wearing this t-shirt so that the bread will know what you are going to do to them. What is your favorite bread? 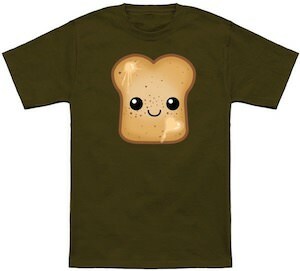 I think it is toast and this t-shirt shows a real happy piece of toast. Do you know what makes toast happy? butter and that is why the toast on this t-shirt look so happy with its wide open eyes and a big smile and the shine of the freshly melted butter that was put on the warm toast when it just popped out of the toaster. You can get this happy toast t-shirt in men and women’s style and in many colors and in sizes Small – 6XL. So if you are a size small now then just get all the sizes because eating all that happy toast may make you go up a couple sizes over time. If you like really like toast then you should check out this super toast t-shirt as it shows toast at it’s best. On the t-shirt you can see a plain white toaster and above it you can see a freshly toasted slice of bread with a big face on it and it even has arms and legs. And if you just look at the face of that toast then you know how happy this super bread really is. This funny toast t-shirt is available in styles for men, women and kids in a wide range of sizes and many fun colors. This one shows French toast but then a little bit different then your are used to eat. This French toast looks like a French men with a Barette, must ache and scarf. It’s funny and the French toast t-shirt comes in different styles and of course sizes. 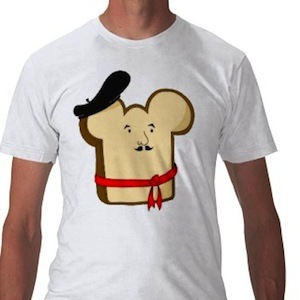 If you are crazy about toast then check out this French Toast T-Shirt. So this dark shirt shows two pieces of bread and in between you see text in different colors like they are ingredients for the sandwich. The words say “if you can read this”, “Make Me A”, “Sandwich” and each line gets bigger. 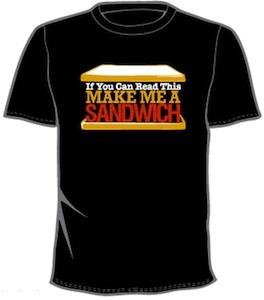 Don’t wait just go check out this funny Make Me A Sandwich T-Shirt. If you are like me then you can’t imagine a life without bread. And that is why this T-shirt would be perfect for me. mmm… bread that is a great statement. Ok maybe i have to go now and bake a fresh bread. 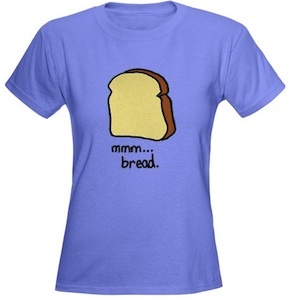 In the mean time check out this mmm… Bread T-Shirt.